MSM stands for: Methyl Sulfonyl Methane. It is one of the most needed elements in human nutrition and it's potential benefits are extensive. 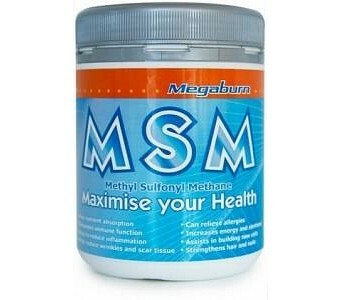 MSM is essential in the regeneration and nourishment of healthy cells. It helps detoxify the body assisting in absorption of nutrients and building of general health and wellbeing. MSM helps; reduce scar tissue, heal wounds and wrinkles by strengthening skin elasticity, helps hair and nails grow faster and stronger, offers relief of swelling, inflammation and pain due to injury or disease such as arthritis. Adding MSM to your daily routine can help to improve your overall wellbeing. Ingredients: MSM - Methyl Sulfonyl Methane. Benefits of MSM Helps our bodies absorb more nutrients. Increases oxygen availability in our bodies. Increases energy levels. Helps reduce inflammation; permits muscle and joints to heal more rapidly. Helps eliminate muscle cramps, spasms and lactic acid build-up. Reduces recuperation time from heavy work and training loads. Assists the body to build healthy new cells. Helps relieve allergies to foods and pollens. Plays a role in collagen production; reducing scar tissue, wrinkles, skin elasticity, and helps hair and nails grow faster and stronger. Stimulates immune function. Can help reduce and even eliminate snoring. Relieves constipation and normalizes stomach function.